Held from November 20th to 23rd in Geelong, Victoria the Act on Climate Festival sought to "empower people with ways they can act on climate change". 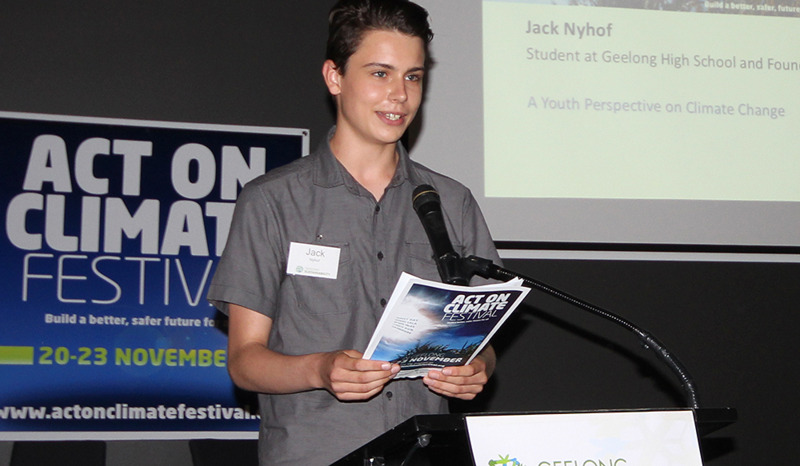 The community organisation behind the festival- Geelong Sustainability Group- aspires to "inform, inspire and connect communities". The group has the vision that region "supports healthy communities, a strong local economy, biodiversity and sustainable ecological systems". The Act on Climate Opening Night and Keynote Address certainly drew from the aims and vision of Geelong Sustainability Group. The night was a thought provoking presentation/ discussion on the realities of climate change. First to speak were relevant community leaders. Councillor Andy Richards from the City of Greater Geelong urged the crowd to support him in making Geelong a more sustainable community. Cr Richards asked for louder community voice to aid his local government portfolio of Environment and Sustainability. "Climate change is real and responding to it is something we all need to do". Dan Cowdell the President of Geelong Sustainability passionately pleaded two simple solutions to climate change- "stop burning fossil fuels", and "encourage individuals to act". He said a false misconception is that climate change "feels like it is a problem for someone else". An impressive line up of industry professionals then had their say on the issues surrounding climate change. Atmospheric Science Professor David Karoly highlighted the facts surrounding global warming. Pointing out that we as a community cannot continue to emit carbon at the current rate. He said we must "de-carbonise our economy". Victoria McKenzie-McHarg, Climate Manager at Australian Conservation Foundation touched on the need for communities (such as Geelong) to have strategies in place which successfully transform local economy from industry based to smart and sustainable. Bob Welsh Executive Director Sustainability Advisers drew from his economic experience to tell the crowd that tackling global warming will be of huge cost to the Australian economy. He went on to add, we must be prepared to pay that price and commit to reducing carbon emissions now, otherwise the future cost to the community will be astronomical. Perhaps the strongest, simplest message came from 14 year-old student Jack Nyhof. To conclude the night a panel style discussion allowed for multiple questions and statements. One question put to the panel was, "What is the best measure our community can take against climate change?". Jack simply answered "Education". Europe's largest river island is home to one of the worlds smartest and sustainable urban developments. Wilhelmsburg is a district of the northern German city of Hamburg. Covering 35km2 the island lies in the middle of the Elbe River and has a population of 50,000 people. It is an incredibly diverse place- there are residents from every corner of the globe. The mixture of residential areas amongst farmland, industry, national park, and shipping ports make this district a unique place. What has certainly added another exciting, diverse element to the district of Wilhelmsburg is the urban development sparked by the International Building Exhibition (IBA) of 2013. Demonstrating how we will live together in a metropolis was the first theme of the exhibition. It was titled 'Cosmopolis'. The second theme was titled 'Metrozone'. This highlighted how to provide space for growth in cities. 'Cities and climate change' was the third theme. It proves that it is possible for cities to grow in an environmentally friendly way. Across Wilhelsmburg a total of 70 unique projects made up the IBA. The main attraction of the exhibition was the central area known as "New Middle Wilhelmsburg". This area is the nucleus of sustainable urban development. It provides many high quality, futuristic examples of residential and commercial buildings in such a small area. Below is a summary of a few of the projects. The 5 buildings which make up the Water Houses residential development show the quality of life which can be achieved when living directly on the water. Using the natural environment (which is literally accessible at the door step) there are numerous benefits to both the resident as well as the environment long term. The buildings incorporate sustainable elements such as solar thermal in the facades which provides hot water to residents, and a geothermal pump system that uses the water to heat the apartments. The building with a "second green skin" implements world first technology that uses photosynthesis to produce energy. Algae in glass panels on the buildings facade grow when exposed to sun. The algae is then transferred as a thick pulp, fermented and turned into bio-gas. The glass panels also offer shading, wind protection, as well as sound and thermal insulation. Click here for more on the process and information on the other sustainable aspects of the Algae House. Renewable and sustainable as well as striking and modern. The idea behind the Wood Cube was to draw attention to and inspire further construction using mostly timber. The building was designed to emit zero CO2 over it's entire lifecycle. The timber on the facade of the Wood Cube is untreated; therefore it can effectively be recycled when the need be. Smart building design in conjunction with the use of renewable energy give the Wood Cube impressively low energy consumption figures. The 3 story, 4 home 'Soft House' uses a "dynamic textile facade to harness sunlight in a versatile and smart way". Apart from shading the building from the hot summer sun the panels incorporate photovoltaic panels which produce energy for the residents to use. The panels automatically follow the sun over the coarse of the day, but can also be manually controlled by the resident to allow more/ less light into the apartment. Simple, sustainable construction! Phase change material, green facades, green roof and photovoltaic and solar thermal panels. This 5 story residential apartment building lives right up to it's name. It is smart in using modern technology to create a green (environmentally friendly) home. Phase Change materials (PCM) incorporated into the facade of the building keep a stable temperature. The (PCM) absorbs and stores heat when it is hot, then releases this heat at night when the outside temperature cools down. An interesting concept.... The basic 5 story "skeleton" of this residential building was constructed then left... Left to the resident who bought the apartment to complete. This allows a couple of things- low cost construction, versatility and future layout changes pending the needs of the resident. Management of the finishing construction must be the key element to ensuring this building remains up to local building standards. This building was originally set up to be the information and visitor centre for the International Garden Show Hamburg, and the International Building Exhibition. Today the building is for mixed use; residential on the upper floors, and commercial space on the lower floor. Green walls and a green roof provide thermal insulation and a geothermal pump system mean IGS Centre uses minimal energy for heating and cooling. The living architecture on the long white facade of the sport centre is not only aesthetically pleasing but also environmentally beneficial. The greenery breaks the long aluminium facade essentially marrying the structure back into the surrounding environment. On the opposite side of the building the wall has been designed to use air to conduct heat. The narrow south facade features full height glass doors which can be fully opened in fair weather and allows for natural ventilation. Arguably the centrepiece of the New Middle Wilhelmsburg development is the 5 to 13 story office building of the Ministry for Urban Development and Environment. The building is the workplace of 1400 government employees working for departments of Urban Development, Geo-Information and the Surveying authority. This building is eye catching. Extensive and intensive green roofs, and a colourfully curving glass facade make this a remarkable piece of architecture to look at. Perhaps the most striking aspect to the building is something you can not see at all. Below the buildings footings 1000 energy piles (up to 18 metre deep) were drilled and sunk into the earth. The Geothermal pumps brings heat from the earth into the building when it is required in the cold winter months. In summer cool air is pumped from the ground below. This technology in combination with the design to make best use of natural ventilation lead to extremely low yearly energy consumption. It is said to have an energy consumption of just 70kwh/m2 per year. That is about 1/4 of what a comparable office building built in the 1970's would use. The roofs of the building also contribute to the low energy consumption figure. The green roofs (both extensive and intensive) provide thermal insulation for the building- keeping it cooler in the summer and retaining heat on the inside in winter. The green roofs are also aesthetically pleasing which (studies have found) increases the performance of the office workers. The green roofs have numerous benefits for the environment. They contribute to a decrease in the urban heat island effect, provide habitat for insects, pollinators and bird life, as well as retain rain water, slowing its flow into the storm water system. Riegersburg Castle is an awe inspiring, historically important fortress perched on top of a steep, volcanic rock hill. Sharply rising 200m above the ground below, the location in combination with age- originally documented in the year 1138- make the castle a monumental construction feat. It dominates the hilly landscape and can be seen from just about anywhere in the area. Two of the best vantage points (tourist attractions in their own right) to marvel at the architecture of yesteryear are actually fine examples of inspiring, modern construction. The Genusshotel Riegersburg and the Zotter Chocolate Factory use the natural environment in a simple but striking way, not only adding astheatic beauty, but also creating buildings with numerous environmental benefits. A style of construction sure to take future generations into the next millennium. This is no ordinary chocolate factory. In fact Zotter could not be further from ordinary. Through persistence founder Josef Zotter has certainly created something special in Riegersburg. For a start the chocolate is special- organic and fair trade, and a range of 365 diverse flavours. Secondly the site on which the chocolate is produced is especially inspiring. To have a better appreciation for the site you must firstly understand the history behind the production. It all began in 1987 as a very small family business. A small shop in the town of Graz was used to produce and sell a very alternative range of chocolate. With an increase in popularity the need came to expand; three more shops were opened. In 1999 production was moved to the former animal stable on the Zotter family farm. A humble beginning for what is now an inspirational tourist attraction. Sure- for the hoards of tourists that visit -the chocolate is the main draw card. But in the valley below, the 27 hectare Edible Zoo places emphasis on transparency, sustainability and innovation. It is here that the visitor can learn and be inspired. The Edible Zoo allows visitors to stroll in a naturally beautiful environment through the fields and pastures of organic produce. The visitors learn that everything on the menu in the onsite organic restaurant comes from the farm. The organic restaurant is powered by solar energy. The 9 large photovoltaic cells track the sun, producing more than 100,000kw per year, enough energy for the restaurant to be self sufficient. Buildings throughout the farm including the restaurant and stables are built using traditional Austrian construction methods. Most of the buildings have extensive green roofs with a shallow substrate and are planted with sedum. One of the main farm buildings is built into the side of the hill. The substrate depth on that roof is noticeable thicker allowing for varied planting. The substrate wraps down the vertical wall adjacent to the restaurant; forming a vertical herb garden. The Zotter website quotes this vertical wall as "architecture for the third millennium". Offering superb views of the Riegersburg Castle the Genusshotel Riegersburg is difficult to spot when passing on the road nearby. That it does not stand out is what makes this building architecturally amazing! Wedged between a vineyard and a row of well established trees the hotel building is cut, terraced style into the natural lay of the land. Essentially each level is like a giant tread in staircase, overlapping one another going up the hill. The low profile, flat green roofs of each level simply marry the building and the grassed hill together. Looking toward the castle from the hotel balconies you look across the roof of the level below. As it is a green roof you barely even realise there is a room underneath. Construction like this will become vital as our world continues to experience global warming, and other extreme weather events. Digging structures into the earth and covering roofs with vegetation will increase thermal insulation. A simple solution leading to a decrease in heating and cooling requirements.